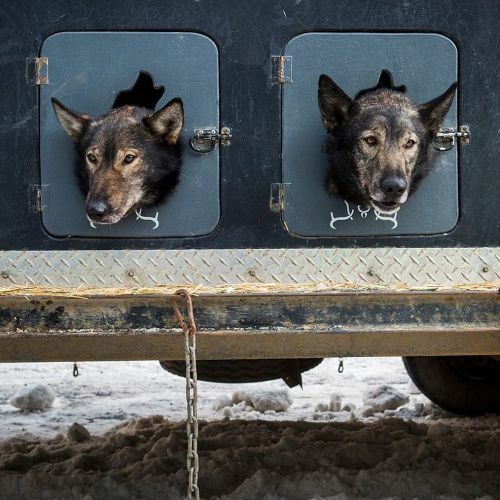 "A pair of dogs before the ceremonial start of the #Iditarod, an annual dog-sled race that has gripped the imagination in Alaska for decades. Every year, mushers and their teams trek nearly 1,000 miles from Anchorage to the finish line in the old gold-rush town of Nome. But this year, they're up against an unlikely foe: warm weather. Anchorage had its 4th-warmest February on record — so warm that snow had to be delivered by train from Fairbanks for Saturday's Iditarod parade. When it comes to the race itself, fewer days of deep-freeze conditions could mean open water on the course. Meanwhile, for the 1,000 or so sled dogs, heat is a bigger concern than cold or even lack of snow. The animals are bred and trained to run in harsh conditions and are happiest at temperatures of zero to minus 10. @katieorlinsky took this photo while on #nytassignment in #Anchorage." By nytimes on Instagram.